As the world’s fifth largest country (in geographic size and population), Brazil is a vital playing field for consumer packaged goods (CPG) companies. Its explosive economic growth over the past few decades catapulted the country into the ranks of the world’s ten largest consumer markets. But operating in Brazil is not for the faint-hearted. And that’s not only because of the country’s recent economic and political upheaval; even at the best of times, Brazil is a tough environment in which to manage a CPG supply chain, for a variety of reasons—geographic, structural, and practical. BCG’s Supply Chain Benchmarking for Consumer Packaged Goods in Brazil followed the quantitative approach used in the firm’s study of the US market that has been conducted in partnership with the Grocery Manufacturers Association (GMA) since 2012. Seven of our 17 participants also participated in the most recent US study, the 2015 BCG/GMA Supply Chain Benchmarking Study, and more than half are multinationals. Our sample encompassed 28 distinct categories within the food and beverage, beauty and personal care, and home care segments and ranged from category leaders to recent market entrants. The diversity of our sample allowed comparisons between companies with wide-ranging revenues (from about $4.75 million to $3.56 billion in gross sales), diverse go-to-market strategies, and different outbound supply chain models (such as wholesale, direct store delivery, and direct sale). We examined major outbound supply chain management processes during the period July 2014 to June 2015, including sales and operations planning, primary (plant-to-warehouse) and secondary (warehouse-to-store) transportation, and warehousing. To obtain a meaningful comparison of the most important cost and service KPIs, we ensured that metrics matched and, where necessary, we normalized the data. In addition to a survey, we conducted in-depth interviews with senior operations executives at the participating companies to gain deeper insights into their challenges, practices, and solutions. Warehousing costs range from as little as $0.11 per case to $4.28 per case (a factor of 40). Transportation costs run anywhere from $49.25 per ton to $1,665.50 per ton (a factor of 34). Customer cycle times range from 1 day to 14 days (a factor of 14). Case fill rates vary from 85% to 99.6% (roughly 15 percentage points). Clearly, the impressive results that some companies achieve prove that difficult operating conditions need not constrain performance. creating virtual scale, and ways to adapt network optimization to fluctuations in tax rates. Considering the practices we uncovered, as well as our work with clients, we have formulated a set of six strategies for supply chain success in Brazil: seek portfolio simplicity, segment the supply chain, gain agility by integrating the sales and operations planning process, make the supply chain more flexible, collaborate to generate added value, and stay focused on operational excellence. Brazil’s geographic expanse and widespread population mean that the distribution of goods is fragmented across many channels. Taxes are high relative to logistics costs, and tax policies are complex and volatile. Companies often make taxes the determining factor in key supply chain decisions. Demand for many products is concentrated in the last week of the month. This causes havoc with inventory and warehouse capacity and drives up transportation costs. These complexities combine to pose challenges that are unlike those found in any other market, developed or developing. Geography makes fragmentation high and scale elusive. Brazil’s sheer size compounds logistical complexity. Providing coverage to remote locales makes fragmentation across channels unavoidable. Unlike in most major markets, large retail outlets are not the main sales channel for beauty and personal care products in Brazil. More than 4.5 million sales representatives cover this segment. In fact companies use the direct-sales channel for these categories more in Brazil than in any other key market in the world; direct sales accounts for 26% of sales in Brazil versus 13% in China, 7% in the US, and 3% in Western Europe. (See Exhibit 1.) Another striking difference between most major markets and Brazil relates to the sale of food and beverage products; in Brazil, they are sold predominantly through independent retailers (such as mom-and-pop outlets and local grocery chains with a small number of stores), which account for about 40% of total revenue. Overall, the top three retailers in Brazil account for just 17% of total food and beverage revenue, while in the US, the top three retailers command about 45% of the total. (See Exhibit 2.) And the difference between Brazil and other major emerging markets is equally stark: large retailers (hypermarkets, supermarkets, and big-box stores) represent a smaller share of food and beverage revenue in Brazil than in countries like China and India. As a result, costs and inventory levels are higher for CPGs that sell mostly through direct sales or direct store delivery. For instance, the costs for beauty and personal care companies that sell via direct sales are 3.7 times higher than those for companies that sell through traditional channels such as hypermarkets and supermarkets. Such companies also typically require 1.5 times more inventory. Moreover, because Brazil’s high degree of fragmentation makes economies of scale hard to achieve through sales channels, CPG companies must find economies elsewhere. By increasing the density of distribution points, they are able to contain secondary transportation costs. Yet even where scale is possible, it’s not necessarily beneficial. In most markets, scale helps contain plant-to-warehouse (primary) transportation costs, but not in Brazil. That’s because tax complexity trumps economies of scale. Companies must adopt workarounds to circumvent tax complexity; specifically, the shortest distance between two points can mean incurring more in-state taxes than a less direct route. Taxes are high and complex, and subsidies are ever changing. Taxes disproportionately influence network optimization in Brazil, for a few reasons. Taxes represent a much higher share of costs than logistics; for the companies in our sample, taxes account for roughly 17% of gross sales, and logistics costs account for about 7% of sales. (See Exhibit 3.) Moreover, tax regimes are extremely complex and subsidies are volatile, so network optimization is often counterintuitive and short-lived. Each of Brazil’s 26 states has its own tax structure, which varies not only by category of goods but also by origin and destination. For instance, a company in São Paulo shipping its product to Rio de Janeiro would pay about 12% in value-added tax (VAT). But if the destination state was Goiás, the tax would be only 7%. Sales tax rates are also volatile, in part because they represent one of the most important revenue sources for the state governments. As recently as 2015, 20 states raised the VATs and excise taxes on at least ten CPG categories. Indeed, in the current economy, governments are straining harder than ever to raise taxes. The complexity of the Brazilian tax system also makes it possible for state governments to engage in fiscal wars to lure large manufacturers to their states. Because each state can negotiate tax concessions, every company needs to consider its tax liability and what that liability means for its costs. Our study found that for the largest CPG companies, tax concessions have become a prerequisite for operating in Brazil. Clearly, some companies have been able to negotiate better subsidies on tax rates than others. We analyzed effective (actual) versus standard tax rates for a basket of representative consumer products in São Paulo—the locus of most consumer demand—and found that most CPG companies have managed to negotiate lower-than-standard rates. They do so by promising to bring jobs, new infrastructure, and overall economic activity to the area. Beyond the cost implications, though, is another issue: tax considerations, which complicate network design. To minimize their tax bills, CPG companies often forsake efficiency in network design, which, of course, prevents them from fully leveraging scale in primary transportation and warehousing. For example, one company in the study ships all of its goods from its São Paulo plant to its Minas Gerais distribution center before delivering them to customers back in São Paulo, adding an extra 370 miles and six to seven hours to the trip. Another built a plant in the northeast primarily to supply Brazil’s southeastern and southern markets, making delivery routes as long as 1,200 miles. Frequent changes to subsidies on tax rates and tax complexity make network optimization a more frequent exercise for CPG companies; 75% of our study participants have redesigned their network at least once in the past five years, and 20% carried out more than three redesigns during the same period. Demand is concentrated at the end of the month. Several CPG companies reported that 40% or more of their monthly sales to retailers and distributors occur at the end of the month. This phenomenon stems largely from the incentives that companies offer their salespeople to meet monthly targets. The growing pressure to meet monthly targets in a recessionary economy incentivizes sales teams to offer aggressive discounts to their customers at the end of the month; customers consequently reserve their demand for goods to take advantage of this beneficial time frame. This end-of-the-month squeeze is exacerbated by roughly three decades of consumer habit: the extreme inflation of the 1980s prompted consumers to stock up in the first week of the month, as soon as they received their monthly paycheck. Even though inflation has long since been tamed (10.7% in 2015, 6.3% in 2016), the behavior is ingrained and has resurged somewhat during the recent economic crisis. So, retailers and distributors rush to fill inventory in preparation for the new month. The high degree of retail fragmentation makes it hard for CPG companies to coordinate incentives and work with retailers to smooth out demand. Such extreme demand concentration, of course, creates a challenge for supply chain managers. To guarantee high product availability in this period, companies end up being saddled with excess inventory, wide fluctuations in warehouse capacity utilization, and high transportation costs. (See Exhibit 4.) Their transportation partners must maintain larger fleets that can meet end-of-the-month demand but that sit idle much of the remaining time. Partners also incur additional costs associated with overnight fees and return trips because of retailers’ warehouse capacity constraints. A number of the companies participating in our study have proven to be resourceful in coping with Brazil’s unique supply chain challenges. They revealed their techniques to us. They rethink their go-to-market model. One direct sales company expanded its network of distribution centers, strategically locating them to establish a pickup system for more than half of its representatives. Some of these centers are in areas that are costly to serve (such as the favelas, or slums, of large metropolitan areas). Customers receive a discount on the final price along with dramatically faster delivery times. This new model has also simplified secondary transportation. Another company leverages its network of retail stores as additional storage locations for its direct sales channel (home delivery accounts), allowing the two parties to split the margin. This strategy balances incentives fairly between the stores and the sales representatives, and it relieves sales reps of the burden of carrying inventory. They invest in operational-excellence programs with transportation partners. A small food company implemented an operational-excellence program focused on small and midsize transportation partners. The program not only ensures full truckloads for those small entities—thus maximizing their operational efficiency—but also grants them a negotiating advantage. Reducing Tax Complexity. Some companies optimize end-to-end supply chain costs by integrating tax mitigation and network optimization. One cosmetics company analyzes its network optimization process every six months, reassessing key variables such as tax rates and demand forecasts so that it can, if necessary, adjust the areas that its distribution centers cover. In this way, it proactively hunts for improvement opportunities and is able to react swiftly to changes in taxation. The department tasked with this effort not only provides analytical expertise but also has helped to open up communications between the company’s legal and supply chain teams. The legal team can now better understand product cost structures and the implications of local regulations. They adjust customer discounts to smooth out demand. Some direct-sales-based companies stagger the closing dates of their product catalogs each month by region. This reduces the number of customers that wait until month’s end to be eligible for discounts, and it spreads out incentive target dates for sales-people. Other companies segment their customer base and offer special incentives to high-volume representatives in order to better anticipate the timing of reps’ orders. They provide end-to-end incentives to optimize margins. Some companies adopt end-to-end margin optimization tactics at both the commercial and the supply chain levels. They offer sales and shipping discounts to customers that buy earlier in the month. They also hold salespeople accountable for sales lost as a consequence of service-level shortcomings and the higher costs associated with concentrated demand. Despite the significant operating challenges in Brazil, many CPG companies are still able to deliver a high level of service and offer variety and choice while remaining responsive to demand fluctuations. Supply chain agility is the key. It is particularly critical for direct sales, given that representatives’ credibility and cash flow depend on it. In that respect, agility is an even greater source of competitive advantage. Interestingly, we found that a higher level of service (as measured by case fill rates) does not correlate strongly with higher costs or inventory levels. Equally counterintuitive was the fact that in this market, high forecasting accuracy alone is not enough to keep inventories low. How do we explain these results? The CPG companies in our study keep their portfolios simple. With fewer SKUs, less value-diluting new-product development, and fewer promotions, forecasting and inventory management become far less complicated. In addition, these companies seek agility in their S&OP processes. One food company, for example, has instituted twice-weekly short-term forecast reviews, rather than relying solely on standard monthly forecasting with a 12-month horizon. It has also tied forecasting to actual orders and updates from the commercial and manufacturing and sourcing teams, enabling it to sharpen supply-demand analysis and continually hone accuracy. Sales targets and manufacturing schedules are adjusted based on these periodic reviews. Finally, the company optimizes its manufacturing lines for low batches and fast changeovers so that it can react quickly to schedule changes. High-performing companies clearly demonstrate ingenuity in Brazil’s tough operating environment. But even they can do better. Most of the 17 companies we studied—high performers included—have room to streamline supply chain costs while improving service levels. For the total sample, we uncovered potential savings of 15% to 20% in total supply chain costs and 10% to 20% in inventory reduction. Achieving sustainable supply chain success requires more than just applying individual tactics or strategies in isolation from core operating processes. This is especially true amid a period of change, as Brazil is currently experiencing, during which leaders implement sweeping reforms to stabilize and strengthen the country’s economy and political institutions. Drawing on our study findings as well as our client experience, we have formulated a set of six tenets for supply chain success in Brazil. Applying any of them individually can certainly yield advantages, but in combination, their effects can be powerful and long lasting. Seek portfolio simplicity. To offset the inherent complexities in the Brazilian market, companies must reduce portfolio complexity. This means more than just eliminating SKU laggards. It also means redesigning or harmonizing the formulas and packaging of high-velocity items so that companies continue to offer the variety that customers need while reducing operational complexity. To be sure, some categories demand more variety and innovation than others. But it is possible to limit variety to a level that is feasible for retailers to carry and yet satisfies consumers. The most effective way to achieve simplicity is to foster a holistic mindset that is shared by the sales and marketing and operations teams. Leaders need to encourage both sides to work together to find the best solutions for the entire company. Together, the teams should establish a structured process for reviewing the current product portfolio, implementing changes in product formulations and packaging that reduce manufacturing and transportation costs and benefit the consumer. Ultimately, the teams can change the approach to product development to achieve sustainable results. Segment the supply chain. Best-practice companies recognize that there is no one-size-fits-all supply chain configuration to serve a market with so many distribution channels. Supply chains should therefore be segmented by customer type, order type, or product type or by any other grouping that makes business sense. Some food and beverage and cosmetics companies we studied segment their customers by postal code, selecting the best transportation mode from a wide variety of options that include motorcycles, minivans, long-haul trucks, and even boats. This approach requires a deep knowledge of the customer base and the ability to deal with multiple transportation providers. Another strategy involves segmenting by customer type or product category to differentiate service levels according to margin and volumes. Companies can then gain the ability to price differently, according to service level. Any segmentation strategy should be governed by two goals: making the best use of assets and maximizing value creation for customers. In our client work, we have found that supply chain segmentation leads to greater forecasting accuracy (with improvements of 10% to 15%) and 10% to 30% less inventory waste. We believe that the need for supply chain segmentation will continue to grow as the Brazilian market evolves. BCG studies show that most of Brazil’s consumption growth over the next ten years will come from small to midsize towns in the nation’s interior. 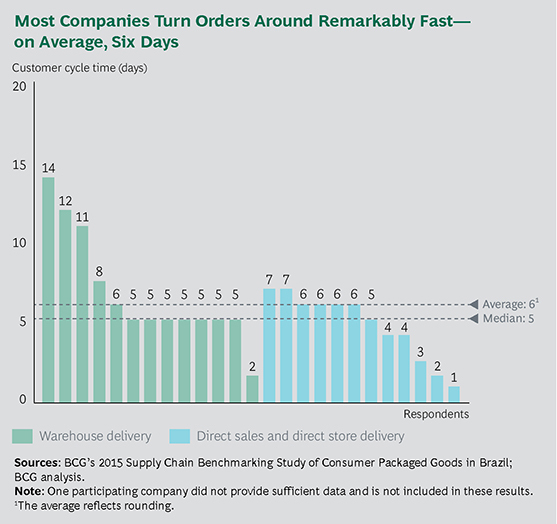 (See Capturing Retail Growth in Brazil’s Rising Interior, BCG Focus, April 2015.) This trend will also favor direct sales and e-commerce and cause further channel fragmentation. In addition, most CPG companies operating in Brazil are rethinking their go-to-market strategies with an omnichannel approach that includes digital sales. Companies will have to adjust their supply chains, because the cost to serve direct-sales and digital channels for the less densely populated interior, based on current models, is too great. Gain agility by integrating S&OP planning. With sales concentrated at the end of the month and demand patterns likely to become even more erratic, companies need more accurate demand forecasting. Equally important is an integrated, cross-functional S&OP process. By leveraging all the data they track—consumer demand, customer sales and inventories, real-time order flows, price changes, and promotions—companies can make the S&OP process more robust. The use of analytics can increase forecast accuracy by 10% to 15%. Big data can also boost S&OP agility; companies can immediately factor new developments into forecasts and conduct more frequent reviews that enable a more timely response to changing conditions. Greater forecasting accuracy will not necessarily lead to higher service levels or lower inventories. The forecast in itself is merely a decision-making tool. But without a structured process and governance to coordinate the entire supply chain—from manufacturing and logistics to sales—forecasting can easily miss important inputs. An integrated approach helps companies respond more nimbly to demand fluctuations and maintain their desired inventory and service levels. Make the supply chain more flexible. A more agile S&OP process requires a flexible supply chain. Manufacturing, for instance, should seek opportunities for product line segmentation to optimize production, whether for product variety and fast changeovers, late manufacturing, different inventory policies that ensure safety stocks in central hubs, or other such needs. A flexible supply chain also calls for close coordination with transportation providers, to allow companies to expand and contract capacity in response to demand fluctuations. Collaborating with Retailers Beyond Just the Largest Key Accounts. Throughout the world, CPG companies have realized considerable value by collaborating with their key customers: developing joint business plans for automated ordering, partnering in demand and sales forecasting, and adopting integrated systems for more transparent inventory management. Brazil’s grocery sector provides an example: The top three grocery retailers account for about 17% of the market. To take advantage of the collaboration strategy, CPG companies need to extend their partnerships to the midtier regional chains that dominate the regional (state) markets. Doing so, of course, means adapting traditional models of collaboration so that they are cost effective and easily replicated. Forging Partnerships with Industry Peers. Peer partnerships are one way to build virtual scale in transportation and warehousing—with certain preconditions. Companies must partner only with peers whose product categories are noncompetitive yet compatible and with which no regulatory restrictions would arise (such as transporting food and cleaning products in the same truck). Partners should also have similar go-to-market models. Once they’ve established their compatibility, companies must negotiate the structure and terms of their partnership, defining roles and responsibilities and quantifying the investment requirements and benefits. Finally, both sides must be able to deliver top performance without disrupting each other’s operations. Teaming Up with Third-Party Logistics Providers. Most of the participants in our study use third-party transportation and warehouse services. There is no clear performance gain in doing so, but in a volatile market, using third-party providers gives CPG companies flexibility and eases the burden of asset ownership. Beyond these benefits, though, deeper partnership—such as developing lean capabilities in warehousing processes and implementing joint improvement projects—can generate tangible value. In good times, Brazil’s operating environment presents unique supply chain challenges. As the country continues to grapple with an ailing economy and political turbulence, these challenges are even more daunting. The government’s recently announced Investment Partnership Program, designed to attract private-sector investment in infrastructure development, is certainly a positive sign, but dramatic improvements will take time. Each of the six tenets of supply chain success, from portfolio simplicity to operational excellence, suggests that a wealth of opportunities are available to offset Brazil’s inherent market obstacles and companies’ own handicaps. These practices can help CPG companies of all sizes achieve higher levels of service without hurting profitability. And those that can weather Brazil’s turbulent times will be better poised to win market share and more consumer goodwill over the long run.